EXCLUSIVE Keisha Castle-Hughes/Whale Rider Interview from the Sundance Film Festival. For New Zealander Keisha Castle-Hughes, a potential Oscar nomination was the furthest thing from her mind when she attended last year's Sundance Film Festival. No sign of a star here, and maybe her plans to be a teacher may fall through come Oscar night. PAUL FISCHER reports. The courtyard of Park City's Marriott Hotel was a far cry from New Zealand for half-Maori Keisha Castle-Hughes. Lying back on a hotel deck chair, sipping elegantly out of a can of coke, the now 14-year old young actress is shy, quietly spoken, and unphased by the journey she has undertaken. "I can't believe it", she says, offering a half smile, nervously accepting praise. When the film was first screened internationally the previous September at the Toronto Film Festival, standing ovations were in abundance, with fellow New Zealander Sam Neill commenting at one such screening: 'Watching that film made me proud to be a New Zealander'. Castle-Hughes remembers that night fondly. "That was pretty amazing, I could hardly believe it." The teenager, who was plucked from obscurity to land the key role of Pai, in the beloved film, was first spotted by New Zealand-based casting director Diana Rowan, who earlier discovered child actress Anna Paquin for The Piano. Paquin won an Oscar for that 1993 role and has since gone on to a successful Hollywood film career, most recently starring in X2: X-Men United. Castle-Hughes, unlike Paquin, had no prior acting experience prior to Whale Rider. None at all. "I'd done no acting at all, not even in school productions," recalled the Auckland-bred teenager. "I've always wanted to act, but it was only because I'd see these beautiful stars, and they would all be wearing beautiful dresses." When told she landed the coveted role, Keisha remembers being "really excited, and kept jumping up and down. I thought I was going to have a heart attack! I rang all my family and all my friends, I had to keep it from my friends during the audition process because it was totally confidential. But it was really exciting, because there were 10,000 girls up for the role." Keisha admits there are certain parallels between the young actress and this remarkable character she has played so effortlessly. "I think we're both strong willed and independent, and Pai has a great unique quality about her. She's an 11-year-old girl who's confident about who she is and knows exactly who she is. Not many 11-year-old girls are like that. She's a great role model for young girls. I think I'm like that too." Now that she has sampled the acting bug, Castle-Hughes admits that there are certain movie stars she hopes to emulate - and meet. "I really like Julia Roberts, I'm not sure why and I don't have a particular movie of hers in mind, but she comes across as very nice and I enjoy watching her. And Halle Berry too." She admits to being typically star struck. While at Sundance, she says laughingly, "I met Dustin Hoffman which was fantastic. He loved the film and said he cried when he watched it. I also met Anna Paquin for a very short time, and that was nice because I'm often compared to her, which is a great compliment." Ironic when one considers that since then, Castle-Hughes remains the second New Zealand child actress to score an Oscar nomination, and the youngest female ever nominated for Best Actress. Yet at the time, of course, she was prepared to put the acting on hold, for a more realistic aspiration. "Acting is a really hard job. I want to be a science teacher. My friends asked me why, but I'm intrigued by it and I'm quite good at science at school." Yet come this month's Oscar night, Keisha, who has since gone to co-star in Star Wars Episode III, will be princess for a night, perhaps sharing tales of drama and stardom with Julia and Anna. After February 29, her science teaching could well be put on hold. 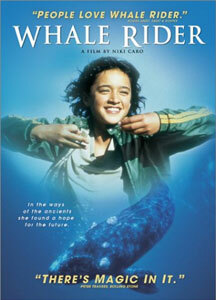 WHALE RIDER is NOW OUT on DVD. THE ACADEMY AWARDS will be presented on Sunday, February 29.